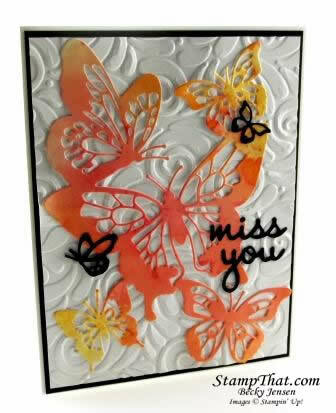 I have another butterfly card to share with you today. This card was a favorite when we made it in class. Every single card turned out differently as we used the Brusho powders to watercolor the butterflies. The Well Written Framelits dies also came in handy for this card. If you’re someone who loves to make cards but it’s a big fan of stamping (I know you’re out there!) this is a great card for you. No stamping necessary!